Mohandas Karamchand Gandhi 2 October 1869 – 30 January 1948) was the preeminent leader of Indian independence movement in British-ruled India. Employing nonviolent civil disobedience, Gandhi led India to independence and inspired movements for civil rights and freedom across the world. The honorific Mahatma (Sanskrit: "high-souled", "venerable")—applied to him first in 1914 in South Africa,—is now used worldwide. He is also called Bapu in India. Gandhi famously led Indians in challenging the British-imposed salt tax with the 400 km (250 mi) Dandi Salt March in 1930, and later in calling for the British to Quit India in 1942. He was imprisoned for many years, upon many occasions, in both South Africa and India. 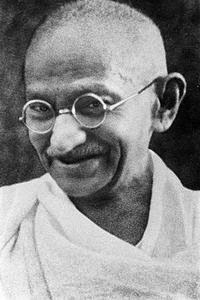 Gandhi attempted to practise nonviolence and truth in all situations, and advocated that others do the same. He lived modestly in a self-sufficient residential community and wore the traditional Indian dhoti and shawl, woven with yarn hand spun on a charkha. He ate simple vegetarian food, and also undertook long fasts as the means to both self-purification and social protest. Gandhi's vision of a free India based on religious pluralism, however, was challenged in the early 1940s by a new Muslim nationalism which was demanding a separate Muslim homeland carved out of India. Eventually, in August 1947, Britain granted independence, but the British Indian Empire ] was partitioned into two dominions, a Hindu-majority India and Muslim Pakistan. As many displaced Hindus, Muslims, and Sikhs made their way to their new lands, religious violence broke out, especially in the Punjab and Bengal. Eschewing the official celebration of independence in Delhi, Gandhi visited the affected areas, attempting to provide solace. In the months following, he undertook several fasts unto death to promote religious harmony. The last of these, undertaken on 12 January 1948 at age 78, also had the indirect goal of pressuring India to pay out some cash assets owed to Pakistan. Some Indians thought Gandhi was too accommodating. Nathuram Godse, a Hindu nationalist, assassinated Gandhi on 30 January 1948 by firing three bullets into his chest at point-blank range. Indians widely describe Gandhi as the father of the nation. His birthday, 2 October, is commemorated as Gandhi Jayanti, anational holiday, and world-wide as the International Day of Nonviolence. He was the mentor of Indira Gandhi. Gandhiji’s life, ideas and work are of crucial importance to all those who want a better life for humankind. The political map of the world has changed dramatically since his time, the economic scenario has witnessed unleashing of some disturbing forces, and the social set-up has undergone a tremendous change. The importance of moral and ethical issues raised by him, however, remain central to the future of individuals and nations. We can still derive inspiration from the teachings of Mahatma Gandhi who wanted us to remember the age old saying, “In spite of death, life persists, and in spite of hatred, love persists.” Rabindranath Tagore addressed him as ‘Mahatma’ and the latter called the poet “Gurudev’. Subhash Chandra Bose had called him ‘Father of the Nation’ in his message on Hind Azad Radio. Mohandas Karamchand Gandhi was born on October 2, 1869, at Porbandar, a small town in Gujarat, on the sea coast of Western India. He was born in the distinguished family of administrators. His grandfather had risen to be the Dewan or Prime Minister of Porbandar and was succeeded by his father Karamchand Gandhiji .His mother Putlibai, a religious person, had a major contribution in moulding the character of young Mohan. He studied initially at an elementary school in Porbandar and then at primary and high schools in Rajkot, one of the important cities of Gujarat. Though he called himself a ‘mediocre student’, he gave evidence of his reasoning, intelligence, deep faith in the principles of truth and discipline at very young age. He was married, at the age of thirteen, when still in high school, to Kasturbai who was of the same age, and had four sons named Harilal, Ramdas, Manilal and Devdas. His father died in 1885. At that time Gandhiji was studying at Samaldas College in Bhavnagar. It was hoped that his (Mohandas’s) going to England and qualifying as a barrister would help his family to lead more comfortable life. He sailed to England on September 4, 1888 at the age of 18, and was enrolled in The Inner Temple. It was a new world for young Mohan and offered immense opportunities to explore new ideas and to reflect on the philosophy and religion of his own country. He got deeply interested in vegetarianism and study of different religions. His stay in England provided opportunities for widening horizons and better understanding of religions and cultures. He passed his examinations and was called to Bar on June 10, 1891. After two days he sailed for India. He made unsuccessful attempts to establish his legal practice at Rajkot and Bombay. An offer from Dada Abdulla & Company to go to South Africa to instruct their consul in a law suit opened up a new chapter in his life. In South Africa, Mohandas tasted bitter experience of racial discrimination during his journey from Durban to Pretoria, where his presence was required in connection with a lawsuit. At Maritzburg station he was pushed out from first class compartment of the train because he was ‘coloured’ Shivering in cold and sitting in the waiting room of Maritzburg station, he decided that it was cowardice to run away instead he would fight for his rights. With this incident evolved the concept of Satyagraha. He united the Indians settled in South Africa of different communities, languages and religions, and founded Natal Indian Congress in 1893. He founded Indian Opinion, his first journal, in 1904 to promote the interests of Indians in South Africa. Influenced by John Ruskin’s Unto This Last, he set up Phoenix Ashram near Durban, where inmates did manual labour and lived a community living. Gandhiji organized a protest in 1906 against unfair Asiatic Regulation Bill of 1906. Again in 1908, he mobilsed Indian community in South Africa against the discriminatory law requiring Asians to apply for the registration by burning 2000 official certificates of domicile at a public meeting at Johannesburg and courting jail. He established in May 1910 Tolstoy Farm, near Johannesburg on the similar ideals of Phoenix Ashram. In 1913, to protest against the imposition of 3 Pound tax and passing immigration Bill adversely affecting the status of married women, he inspired Kasturbai and Indian women to join the struggle. Gandhi organized a march from New Castle to Transvaal without permit and courting arrest. Gandhi had sailed to South Africa as a young inexperienced barrister in search of fortune. But he returned to India in 1915 as Mahatma. As advised by Gopal Krishna Gokhale, Gandhiji spent one year travelling in India and studying India and her people. In 1915 when Gandhiji returned from South Africa he had established his ashram at Kochrab near Ahmedabad. Now after year’s travel, Gandhiji moved his ashram on the banks of Sabarmati River near Ahmedabad and called it Satyagraha Ashram. His first Satyagraha in India was at Champaran, Bihar in 1917 for the rights of peasants on indigo plantations. When British Government ordered Gandhiji to leave Champaran, he defied the order by declaring that “British could not order me about in my own country”. The magistrate postponed the trial and released him without bail and the case against him was withdrawn. In Champaran, he taught the poor and illiterate people the principles of Satyagraha. Gandhiji and his volunteers instructed the peasants in elementary hygiene and ran schools for their children. In Ahmedabad, there was a dispute between mill workers and mill owners. The legitimate demands of workers were refused by mill owners. Gandhiji asked the workers to strike work, on condition that they took pledge to remain non-violent. Gandhiji fasted in support of workers. At the end of 3 days both the parties agreed on arbitration. Same year in 1918, Gandhiji led a Satyagraha for the peasants of Kheda in Gujarat. In 1919, he called for Civil Disobedience against Rowlatt Bill. This non-cooperation movement was the first nationwide movement on national scale. However, the violence broke out; Gandhiji had to suspend the movement as people were not disciplined enough. He realized that people had to be trained for non violent agitation. Same year he started his weeklies Young India in English and Navajivan in Gujarati. In 1921, Gandhiji took to wearing loin cloth to identify himself with poor masses and to propagate khadi, hand spun cloth. He also started Swadeshi movement, advocating the use of commodities made in the country. He asked the Indians to boycott foreign cloth and promote hand spun khadi thus creating work for the villagers. He devoted himself to the propagation of Hindu-Muslim unity, removal of untouchablity, equality of women and men, and khadi. These were important issues in his agenda of constructive work – essential programmes to go with Satyagraha. On March 12 1930, Gandhiji set out with 78 volunteers on historic Salt March from Sabarmati Ashram; Ahmedabad to Dandi, a village on the sea coast .This was an important non violent movement of Indian freedom struggle. At Dandi Gandhiji picked up handful of salt thus technically ‘producing’ the salt. He broke the law, which had deprived the poor man of his right to make salt .This simple act was immediately followed by a nation-wide defiance of the law. Gandhiji was arrested on May 4. Within weeks thousands of men and women were imprisoned, challenging the authority of the colonial rulers. In March 1931, Gandhi-Irwin Pact was signed to solve some constitutional issues, and this ended the Civil Disobedience. On August 29, 1931 Gandhiji sailed to London to attend Round Table Conference to have a discussion with the British. The talks however were unsuccessful. In September 1932, Gandhiji faced the complex issue of the British rulers agreeing for the separate electorates for untouchables. He went on fast to death in protest and concluded only after the British accepted Poona Pact. In 1933, he started weekly publication of Harijan replacing Young India. Aspirations of the people for freedom under Gandhi’s leadership were rising high. In 1942 Gandhiji launched an individual Satyagraha. Nearly 23 thousand people were imprisoned that year. The British mission, headed by Sir Stafford Cripps came with new proposals but it did not meet with any success. The historic Quit India resolution was passed by the Congress on 8th August 1942. Gandhiji’s message of ‘Do or Die’ engulfed millions of Indians. Gandhiji and other Congress leaders were imprisoned in Aga Khan Palace near Pune. This period in prison was of bereavement for Gandhiji. He first lost his trusted secretary and companion Mahadev Desai on 15th August 1942. Destiny gave another cruel blow to Gandhiji, when Kasturbai, his wife and companion for 62 years, died on 22 February 1944. Gandhiji was released from prison as his health was on decline. Unfortunately, political developments had moved favouring the partition of the country resulting in communal riots on a frightful scale. Gandhiji was against the partition and chose to be with the victims of riots in East Bengal and Bihar. On 15 August 1947, when India became independent, free from the British rule, Gandhiji fasted and prayed in Calcutta. On 30th January 1948, Gandhiji, on his way to the prayer meeting at Birla House, New Delhi, fell to the bullets fired by Nathuram Vinayak Godse.